In a brightly lit classroom in Northeastern University’s Snell Library, high school students from all across Boston race to solve an exponential equation written on the white board. A teacher and two mentors circulate the room, answering questions and providing help. Next door, another group of kids take meticulous notes as their teacher projects equations from a tablet’s digital notebook. And in another classroom, a sign language interpreter stands alongside a teacher, translating the lesson for a student. For six weeks this summer, nearly 100 rising high school seniors from Boston Public Schools are spending 7:30 to 9:30 a.m. – before many head off to summer jobs – from Monday to Thursday improving their math skills to prepare for rigorous calculus courses this fall. Bridge to Calculus was founded by Northeastern professor Bob Case to empower kids from Boston’s underserved communities to take and achieve in advanced math classes. The program is now helmed by Don King, undergraduate director for Northeastern’s College of Science. For the first time this year, MIE is helping fund the program, thanks to a grant from the Mabel Louise Riley Foundation. 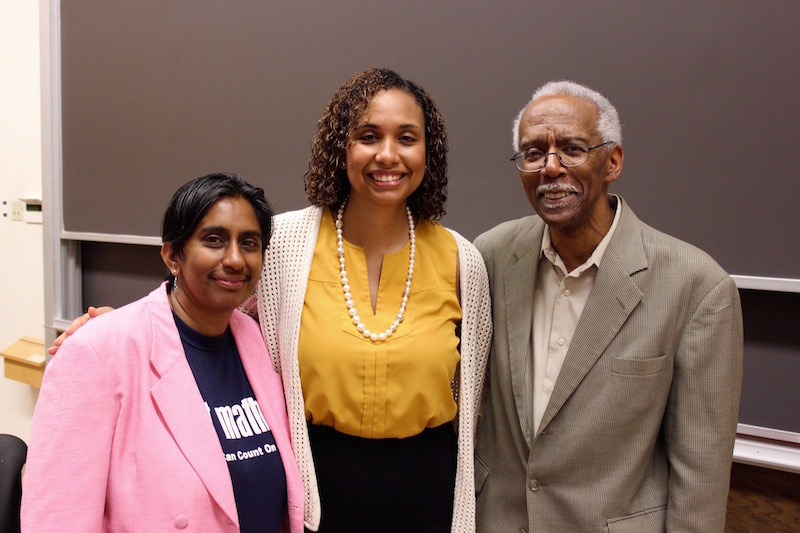 Raj Jesudason and Don King, Associate Professor of Mathematics at Northeastern University, with recent Bridge to Calculus guest speaker, Dr. Frinny Polanco Walters (center). For students like Vy, Bridge to Calculus can open doors to college and career opportunities that once seemed out of reach. Take, for example, Bridge to Calculus alumna Dr. Frinny Polanco Walters. Frinny, who studied at Brown University and New York Medical College is now a pediatrician at the Floating Hospital for Children at Tufts Medical Center. She credits the program for giving her the academic confidence to pursue her studies and career. “This isn’t just a bridge to calculus – it’s a bridge to college, to career,” Frinny said when she recently addressed this summer’s Bridge to Calculus students. She’s come back to speak about the program twice to tell students they can achieve their goals, even if they, like her, come from families that don’t have the resources or knowledge to encourage college attendance and success. Since she was young, Frinny dreamed of being a doctor, but she didn’t always feel supported in school or capable of achieving in tough math and science classes. Bridge to Calculus changed that – the work ethic, reasoning skills and academic confidence she gained from the program fueled her to reach for that dream. Across the board, students who are given the opportunity to take rigorous AP classes are better prepared for college, and often persist and graduate at higher rates. MIE supports Boston Public School students in Advanced Placement classes like calculus during the school year, so the collaboration with the Bridge to Calculus program allows learning to continue all year long.